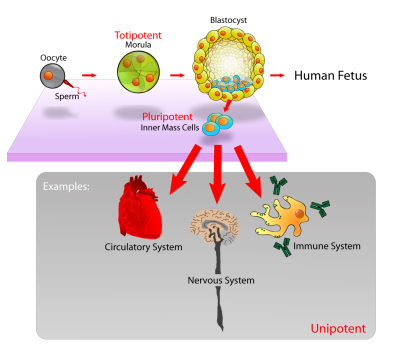 Pluripotent stems cells source from developing embryos. Diagram by Mike Jones. Scientists and politicians weighed in on the topic of federal funding for human embryonic stem cell (hESC) research last Thursday before a Senate subcommittee hearing. The hearing was convened by Democratic Senator Tom Harkin, chairman of the United States Senate Appropriations Subcommittee on Labor, Health and Human Services, Education, and Related Agencies – which is responsible for providing funding for the National Institutes of Health (NIH). 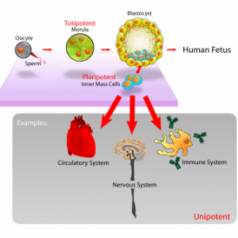 Human embryonic stem cell research is considered promising for the treatment of a variety of ailments, including Alzheimer’s disease, Parkinson’s disease, diabetes and heart disease. Embryonic stem cells do not yet have an identity, they can become any type of cell, and scientists hope to be able to program them to become any number of new tissues. In March of 2009, President Obama signed an executive order that repealed Bush-era limits on federal funding for embryonic stem cell research, stating that, “medical miracles do not happen simply by accident.”  The order called for the establishment of new guidelines by the NIH to allow for expanded federal funding for hESC research within the restrictions of current federal law. Under the new guidelines, researchers gained access to the use of federal tax dollars for hESC research beyond the few stem cell lines that had been allowed under the former Bush policy. On Aug. 23, U.S. District Court judge Royce Lamberth issued a preliminary injunction barring any federal funding for embryonic stem cell research under the new guidelines, stating they violate an existing law that prohibits funding for research that involves the destruction of embryos. On Sept. 9, a U.S. Court of Appeals placed a temporary hold on the injunction in order to allow time for the court to review the administration’s appeal. The court directed both sides to file briefs by Sept. 20. Researchers hurried to continue work that had been prohibited under the initial injunction. The U.S. Court of Appeals has scheduled 30-minute oral arguments for Sept. 24. The result of the appeal could affect how quickly Congress acts on the issue.